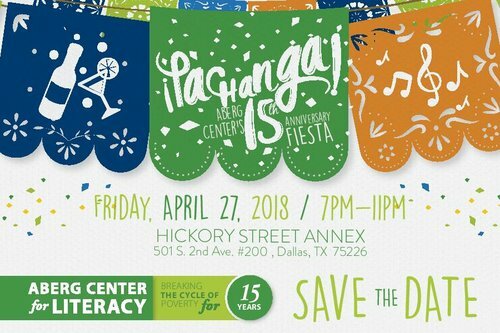 DALLAS, TX, MARCH 9 – –Celebrating 15 years of breaking the cycle of poverty through English fluency and literacy education, Aberg Center for Literacy is throwing a Pachanga! The event promises the colorful elements of a fiesta with surprises in the mix to ensure a lively tribute to Aberg Center’s life-changing impact on individuals, families and the entire community. Pachanga! is set for April 27 at Hickory Street Annex in Dallas. The event is co-chaired by the husband and wife team of Michael and Ronei Moroney, longtime advocates of Aberg Center. Aberg Center for Literacy is a 501c3 organization that provides tuition free courses in English fluency, GED preparation in English and Spanish, early childhood learning and family literacy. Founded by the late Charles Aberg the program fosters a legacy of economic security that passes from one generation to the next. Now operating in two East Dallas locations, Aberg Center is led by Executive Director Shana Harrison, and staffed by a team of 10 employees and over 200 volunteers.